The Apple Watch is an awesome exercise accessory. It has really useful apps for tracking distance, activity, calories burned, heart rate and more. 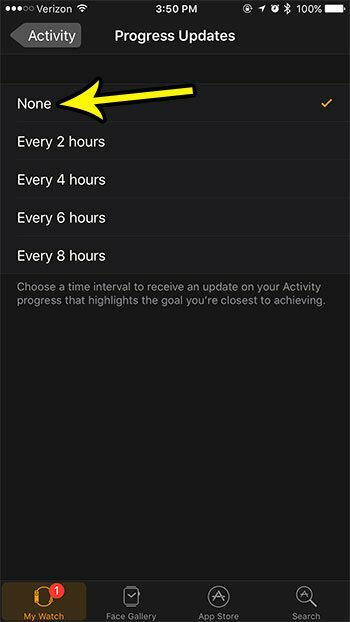 Much of this tracking occurs in the Activity app, where you have three different goals that you try to achieve each day. Part of this app includes updates throughout the course of the day to let you know how your progress is going. These updates can vary in frequency, but it’s likely that you are seeing them at least a couple of times. But you may find these to be somewhat nagging or unnecessary, leaving you looking for a way to turn them off. Fortunately you have the ability to completely stop the progress updates for the Activity app, and you can do so by following the steps in the guide below. The steps in this guide were performed for an Apple Watch using the 3.2 version of the WatchOS software. The iPhone being used is an iPhone 7 Plus in iOS 10.3.3. Note that this is only going to stop the periodic Progress Update notifications that you receive throughout the course of the day. It will not affect any activity tracking that is being performed by the watch or the phone. Step 2: Touch the My Watch tab at the bottom of the screen. Step 3: Scroll down and choose the Activity option. Step 4: Select the Progress Updates option. 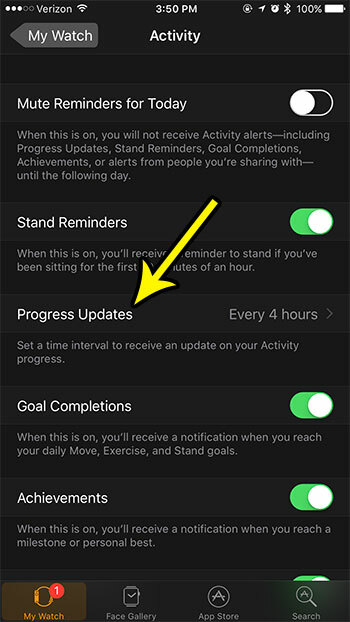 Step 5: Tap the None option to turn off the progress updates for your Activity app. 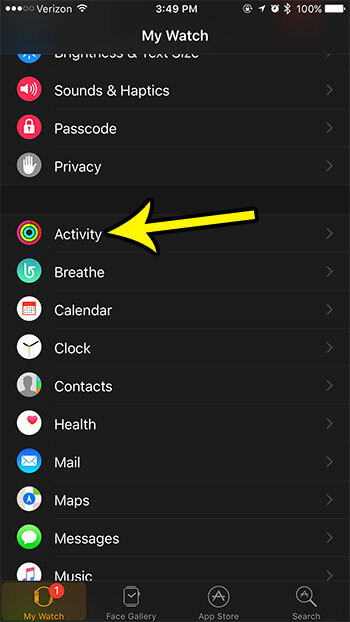 It’s likely that this is one of the notifications that is most troublesome for you on your Apple Watch. Learn how to turn off the Breathe reminders on your device as well if that is also something that is giving you problems.